My friends Rob and Margret are an interesting pair. Both very smart which always makes them fun to hang out with. But she's a vegetarian. Not that there's anything wrong with that. It just means that Rob, who does appreciate good animal flesh, doesn't get to eat it as often as he might like. This is why he told me about the Bacon of the Month club. And gently encouraged my joining. It's pretty much exactly what you would expect. Every month they send out a new and different type of bacon to a bunch of aficionados for their bacon pleasure. And now I am one of those bacon snobs. But the welcome package just arrived and I had to share the goodies that lay within. 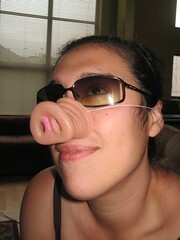 Especially the little pig snout that Gen saw and quickly needed to try on. (I'm still happy she didn't try to get it on Ishy). Of course all of life is about balance. And in order to maintain this balance, I've signed up for the Gorilla Run. This has two balancing actions. First off I feel like I'm trading pigs for gorillas (seems like a good trade in my book). While I'm contributing to pig death, I'm also contributing to gorilla life. Second, while I'm going to be taking Rob away from Margret for some Boys&Bacon™ nights, I'll be helping out Margret with her gorilla run. Now I don't usually do the whole donation thing, but I'm going to make a plea here. Mostly because gorillas are freakin' awesome. We should make sure that these creatures (that had some awesome bigfoot-esque legends about them in the colonial days) are still around. I'm not prideful here. Any donation will do. So please help donate so I'm not left just a fool running in a monkey suit. a popular word among motorcyclists and bicyclists for four wheeled motor vehicle drivers. The term is often used in a derogative sense, because the car body effectively forms a cage, isolating the said driver from having to interact with other road users. The term was coined by motorcyclists. Some ignorant cager nearly hit me while I was biking. Idiot obviously wants a U-lock to the face. It's amazing how learning a new word can change how you view the world. I suppose that shouldn't be surprising given my recent tendencies to view consciousness as nothing more than a language processing program sitting on top of a billion year old OS. Still some times it surprises me. Just by adding the term "cager" to my working vocabulary (and it wasn't even until today that I finally said it aloud) I've undergone a fairly serious review of my attitude towards the car/bicycle/motorcycle interactions I engage in. Helo 3 public beta opened today. There were a few small glitches with the Crackdown beta (I didn't try to do the rule-of-three thing) but I got a game in tonight (came in second while half the time trying to figure out the button remapping and shield stuff). I'm gonna leave it at one game tonight. Gen's having some Halo flashbacks to a friend's ex, so I need to make sure to show that it won't be a problem for me to put the controller down. But, once she goes to work tomorrow, Game on! So there has been a long hiatus on my blogging. There are a variety of reasons on it, but there was one incident that caused about 60% of the lack of blogging, so I'm going to blame everything on that and move forward. 1-800-flowers fucked me on Valentines day and forgot to bring the lube. I went through a lot of prep to make sure Gen would get some nice flowers delivered to her office on Valentine's Day. I talked with her boss to make sure there wouldn't be any problems (I had fears that flowers in a Doctor's office could be a problem with allergies or such), and I paid extra to ensure Valentine's Delivery. I've studied enough basic supply/demand economics to understand that and not get to irate over it. But here's the rub. They never showed up. And neither Gen nor I received any notification of any sort that this was going to/was/or had happend AT ANY TIME. Instead Gen's boss kept asking if a package had arrived (it was supposed to be a surprise), and ended up telling Gen about it when she had to go home and all parties where disappointed. And meanwhile I had been calling their support number to no avail to find out WTF was going on. Gen and I went to a very nice Mexican restaurant called Maya (which I had selected because of her Guatemalan heritage. Speaking of which we should totally go back) And we had a very romantic evening, and things went well. It was two days before I found out what happened to the flowers. As it turns out a snow storm in New England was "to blame". Somehow their capacity to deliver flowers is so fragile that they some sort of chain-reaction occurred obliterating all of their capabilities. Including phone support. So they were unable to even let anyone know what was going on. I got all my money back and got the OK to convert it into a present for Gen, so it wasn't a huge loss. And I'm back to blogging now because I've successfully had FTD and Telegraph Flowers (link love for both of you guys) deliver flowers to my mom at home (Mother's Day) and Gen at work (her birthday) . I am currently in china now until mid june. I tried signing on to the timesheet web site thru sera but have no luck clocking in. Is there anyway for keith allas or you to put in the times for me? Apparently all Keith's look alike to asians. And it made me realize two things. AOL and Juman are still together after all these years. Whoa! More on my absence from the blogosphere later. Or not. Who knows?